Prairie Path Pet Care is not only your pet’s new best friend, but also a resource you can count on to help manage your busy lifestyle. We specialize in daily dog walking, dog sitting, pet sitting, grooming and training. We also offer an array of other services for both small and large pets. Let us be there for you and your furry family members when you can’t be! We bring professional pet care, reliability and technology, together. Prairie Path bridges the gap between your home and work life, so you can relax knowing that your pet will receive the attention, exercise and break they deserve when you can’t be there for them. We use absolutely no independent contractors, our dog walkers and pet sitters are all dedicated employees and a true part of our team. Walkers undergo a rigorous training program to ensure we are always delivering the very best service available. No more hand written notes! Your pet's visit comes with GPS tracking and realtime e-mail notifications when we come and go. We'll also include a detailed summary after every visit. Don't stress it! We're bonded and insured for your peace-of-mind. No need to just take our word for it, we will provide you documentation of both prior to service. We employ pet lovers first. 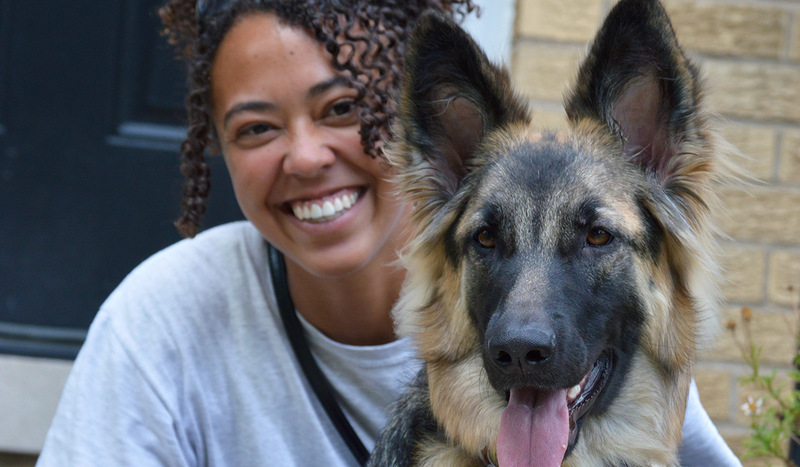 Your dedicated Pet Pro is trained in Dog/Human Behavior and CPR/First Aid certified. Each of our pros go through a background check, phone screen and in-person interview. We give back. We love what we do and are proud to support local events in the communities we service and local pet care non-profits. If the pet services industry is the haystack, then we're the needle! We know how hard it is to find great care for your family pet. 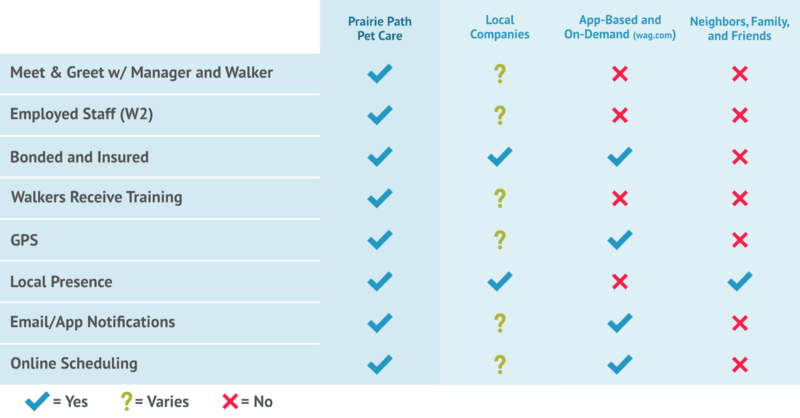 You have many options and at Prairie Path we feel that being educated on the many choices will help you pick the right pet care. Let us help you see why Prairie Path is the best choice for you and for your furry one. Services for all of your pets needs. From dog walks to critter care and even on your special wedding day, we can meet you and your pets needs. Heck, we’ve even cared for a monkey. Just saying. * Listed prices are the base rate and may change depending on clients scheduling needs and service add-ons (such as additional pets or holidays). Dog running available upon request and runner availability. Please call for details. It's not all gone to the dogs! View our full suite of services. See what our clients are barking about. The service we received from Prairie Path Pet Care exceeded our expectations. Our English Bull Dog, Rudy loved Zach! We went out of town for the weekend and Zach came out twice a day to feed Rudy and give him plenty of exercise. Zach put in a tracker that sent me e-mails of when he arrived, the duration, and personalized messages of how Rudy was faring. This provided us with trust and peace of mind that Rudy was doing well and in good hands. I would highly recommend Prairie Path Pet Care! Awesome experience!